The picture in sub-Saharan Africa is especially stark. Infant mortality rates have improved in much of the world. But in several African countries, the picture is the opposite: 17 percent of newborns do not live to the age of 5. 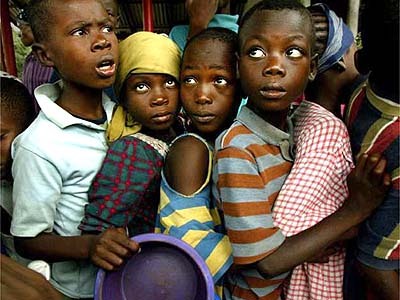 Sub-Saharan Africa has 10 percent of the world's population and 90 percent of its AIDS orphans. Squeezed by foreign debt, many governments have spent less and less on basic social services. Some poor countries, the United Nations report found, spend three to five times as much paying off foreign debt as they do on basic services. At the same time, rich countries fell far short of the commitments they made at the 1990 summit meeting: to devote an average of 0.7 percent of their gross domestic product to development assistance. Only four countries, Denmark, Netherlands, Sweden and Norway, met the 1990 goal. The United States ranked No. 22 among donors, with 0.1 percent of its G.D.P. devoted to aid. Note the phrase "squeezed by foreign debt." That doesn't mean "spent too much on Cadillacs and caviar" in Swahili. It means that because of structural problems, poor countries don't have enough to spend on people. If corruption and waste exist, they're relatively minor problems. You forgot the subject of your "translation." The previous undemocratic regimes supported by the US or another colonial power "already borrowed a sh*tload of money," so the present semi-democratic regimes that have little or nothing to do with the previous regimes have to pay back their debts. When the US seceded from Great Britain, it summarily canceled the treaties the British had signed with the Indians, saying it wasn't bound by the past. So you're saying we should've honored those British treaties instead? We still have them on paper, so let me know which states you think we should give back to the Indians. The entire US west of the Appalachians officially belonged to them. You apparently don't seem capable of distinguishing between corrupt regimes and the people who are actually suffering. Apparently you'd let a few million people die to teach a few dozen bureaucrats a lesson. This is where I correctly conclude you care more about your pocketbook than people, making you a typical conservative. If your business fails, you can declare bankruptcy and get a fresh start in life. Canceling the developing countries' debts would be equivalent to letting them declare bankruptcy. Not surprisingly, you think white Americans should have a privilege that black Africans don't. The US bankruptcy system is "bad business," yet it functions nicely. Perhaps that's because people rule this country, not corporations. At least in theory, that is. See the recent article on Malawi. Many factors cause hunger, of which corrupt governments is a relatively minor one. Some are climactic factors beyond anyone's control, but many factors are within our control. Repeat: our control, not the Africans' control. Tell it to your right-wing buddies who refuse to tolerate abortion, family planning, or any alternative to abstinence. Your ilk is a prime contributor to the world's overpopulation. Letting people die = best solution? So you're clearly in favor of letting people die? Thank you, Ms. Conservative Compassion. Birth rates decline when economies grow. That connection is well-documented. And many of Africa's problems have nothing to do with overpopulation. For instance, African countries aren't as populated as the US, but AIDS is striking them hard. That AIDS started there is a freak of nature, not a punishment for inefficient economies or backwards cultures. And forcing them to continue paying their debt will magically solve their problems? I'd love to hear your deep, hockey-influenced explanation of that one. As with most problems, money is a necessary but not sufficient solution to the developing countries' problems. Money won't necessarily solve the problems, but no money definitely won't solve them. Even Dumbya understands that giving aid makes sense if you couple it with reforms. If someone that ignorant can get it, why don't you? Wrong. America was a colony, which is an official part of the parent country. Not really. When an African country overthrows a repressive regime and restores democracy, complete with a new constitution, it's conceptually close to what America did. The only difference is that the regime is internal rather than external. No, I hold the indebted countries' repressive governments responsible and you hold their people responsible, even though the people had little to do with the repressive governments' decisions. You're willing to punish people, even let them die, for the abstract principle of forcing governments to pay off their debts. Yet I'm sure you recognize the right of white Americans to declare bankruptcy and wipe out their debts. Hmm...white Americans can do it, but not black Africans. What does that make you? All Americans have the right, but white Americans take the biggest advantage of it, since they have the greatest wealth and therefore the biggest debts. Whole corporations, all run by white Americans, can declare bankruptcy and eliminate billions of dollars of debt. Let me know when you have an opinion on white Americans or any Americans canceling their debts like black Africans want to do. The notion that America is color-blind�that racism doesn't happen if we pretend it doesn't happen�leads to many of our racial problems. If you're not part of the solution, you're part of the problem (I just made that up). You weren't thinking, period. Or you wouldn't insist that poor, Third-World countries�almost always full of brown-skinned people�must pay their debts while rich, white Americans can get away scot free. Clearly you don't think about the buried assumptions in your positions. Luckily, you have me to point them out for you. I wonder how many millions of times people have said they don't have a racist bone in their body. Then they propose policies that have the effect of discriminating based on race. The brouhaha over Indian mascots is a perfect example. Mascot lovers say they're honoring Indians, but Indians don't feel honored. More important, mascot lovers don't honor other ethnic groups the same way (with the tired exception of the "Fighting Irish"). Result: Discrimination. We can't know what people are thinking, but we can know how they act. When a policy results in racial discrimination, it doesn't matter what the alleged intent was. The effect is still racist. Your comments reflect a common misunderstanding: that people can't be racist unless they intend to be racist. Wrong. Racism occurs when races are treated differently, not when someone feels differently toward them. I'll assume whatever the hell the evidence lets me assume. If you have an alternate explanation for why we should forgive Americans' debts but not Africans' debts, please provide it. Now. I'll change my assumptions, if necessary, based on the new evidence. They're technically not the same thing because there's no legal forum where countries can declare bankruptcy. And because the world community won't let countries go bankrupt. But they're conceptually the same issue. The World Bank and IMF impose tons of requirements and restrictions on ailing countries in return for debt relief. I wouldn't be surprised if they're as onerous as the requirements and restrictions imposed on US debtors in bankruptcy court. Point is, you don't have a clue what we force countries to go through. I'm guessing you haven't even thought about this issue until now. So forgive me for questioning whether your positions are sincerely based on the technicalities of bankruptcy law. You have no reason to forgive Americans' debts if you believe in the principle of paying off debts. That's basically what we're doing now. It hasn't solved the fundamental problem, although it's probably kept some people from starving. More change is needed, which is why there's a growing worldwide movement to forgive Third World debt. Maintaining the status quo means continuing to let people die. Of AIDS, especially. So you want little black children who didn't incur the debt to perish because someone a thousand miles away made a bad economic decision. Sounds like the textbook definition of a cold, compassionless conservative (if that isn't redundant) to me. And why wouldn't you apply this same "solution" to rich (white) American individuals and corporations? Let them suffer as long as it takes until they fulfill their moral obligations? What's the big difference between an internal and external regime change? One begins with "in" and the other with "ex"? Either way it may involve a complete replacement of the leadership, a complete rewriting of the constitution and laws, or both. Compared to such a fundamental change, the question of whether it originates internally or externally is almost trivial. So should all the white Americans (individuals and corporations) who take loans and then declare bankruptcy. But you don't hold these white Americans to the same standard. Odd. The Africans are using the money for food and medicine, among other things. So if they can't pay the loans back because of reasons beyond their control, they shouldn't take the money? So you'd prefer they suffer and die? How is that comparable to a loan to a corrupt African government that is overthrown and replaced with a more democratic one? It's more like a case where the owner of a house dies. If you move into the same house sometime later, you don't have to repay his debts. You're only obligated to repay your debts�the ones you explicitly contracted and signed for. Nations don't have bankruptcy courts, so the cases aren't comparable. But I recently read something about a move to set up the international equivalent of a bankruptcy court for countries. That would give them an official, as opposed to unofficial, means of eliminating onerous and unmanageable debt payments. So debts and bankruptcy are connected on the international level. If a world body said a country was officially bankrupt, would you accept the concept of eliminating debt payments then? I sure hope so, because your last rationale for treating Americans differently from Africans would be gone. Unless you spend all your money on hockey pucks or whatever and then declare bankruptcy because you don't feel like living up to your responsibilities. Not our fault if all Africans happen to go bankrupt? If you permit blue-eyed people to declare bankruptcy in one country but not brown-eyed people in another, quite possibly. No, race is inherent in this discussion. We have different standards for African countries than white, European-based countries on many issues. If Britain or Germany were suffering a famine, for instance, there would be a huge outpouring of American help. We saw that after WW II, when we implemented the Marshall Plan to rebuild Europe. Before the "war on terrorism" began, some said we needed a Marshall Plan for Afghanistan. Bush fought that concept and still isn't spending as much as Afghanistan needs to recover from the war. Why not, if rebuilding nations was good enough for his pappy's generation? Is Bush saying that generation was wrong to rebuild Europe? 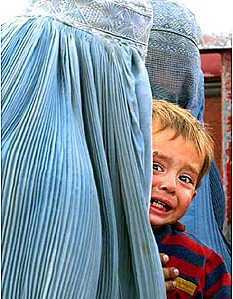 Or is his position different because Afghans are swarthy Muslims rather than cleancut Christians? The implications are that you look for hidden agendas to make sure race isn't a causative factor�as it often is. Police brutality is a good example of that. Is it just a coincidence that police invariably beat or shoot a black person "inadvertently"? Is it because police patrol more often in black areas, which have higher crime rates? Or is it because the largely white police force has a conservative, us-vs.-them, law-and-order mentality that equates to racial superiority? Bankruptcy is a remedy for overwhelming debt. I'm talking about it and you're avoiding talking about it, because you don't like the implications. You're refusing to extend to Africans the same right Americans have. Maybe it's a class prejudice rather than a racial prejudice, but you're discriminating for some reason. If you think a situation is color-blind when it's not, you have a racial problem. It's the old level-playing-field conundrum. If a black person has a crippling history of injuries, you can't just put him at the starting line with a white person and say, "You're equal. Now run the race, and let the best man win." You're discriminating on the basis of race by ignoring the problem based on race. Because if the white person had the same crippling problem, you'd make allowances for it. That's why most (white) Americans are willing to make excuses for criminal CEOs but not criminal crack dealers, even though the former cost society much more than the latter. You can understand a white CEO because his experiences are (presumably) similar to yours. I don't think France owes us anything on a government-to-government basis. But let's see what happens when Russian children are at risk of dying. Are you willing to let them perish too? Whether Japanese- and Chinese-type Asians are truly "brown" people is another question. But yes, I know. I wrote a whole essay on the confusion between race and geography in X-Men comics, of all things. You'll see I argued against someone's multicultural claims, which shows my nuanced views on the subject. I don't think you have to have a complex mind to make an assumption or implication. In fact, prejudice may be an inherent human attitude. Doesn't every baby think "I'm the center of the universe"? A complex mind is necessary to overcome our core assumptions, not to form them in the first place. LA's Museum of Tolerance has a cute gimmick. At one point the guide shows you two doors and says one is for people without prejudices, the other for people with prejudices. If you're foolish enough to try the doors, you find the one for people without doesn't open. Implication: None of us are free of prejudice. No, we're talking about the possible reasons why we'd forgive American debt but not African debt. One possible reason is racism. If you Irish people want to rise up and protest your stereotypical depiction as fighters, I'll support you 100%. Let me know when that happens. Things like that don't just happen. You're ignoring the hidden assumptions in your scenario, again. We define what the crimes are before we set the police loose to catch criminals. Crack cocaine, big-time crime. The same amount of powdered cocaine, small-time crime. Stealing $10,000 from a bank, felony. Stealing $10,000,000 from a pension fund, accounting technicality. Etc. If every law literally had no racist implications or agendas, that would be inane. But that isn't the case. Yeah, and it's insulting to give Indians treaty payments or inner-city dwellers welfare payments. But oddly, neither group feels insulted by these payments. I love it when someone other than the party in question feels the party in question should feel insulted. Or should feel honored, in the case of mascots. Meanwhile, you're still finding excuses to let black children die. Sorry if it offends you if I point out this fact. Change the fact and I'll stop pointing it out. I'm talking about what I'm talking about. I started this conversation with my posting. Therefore, the scope of the conversation is what I say it is. Right, because they're all prejudiced for reasons of nationality, race, or religion. Too bad people like me are willing to note these prejudices. Because the debt repayments are exacerbating the problem�taking food out of the mouths of babes, figuratively speaking. You're not rational on this issue, so that isn't a problem. The rational approach is to recognize the problem and deal with it, not to excuse it or ignore it. A connection is relevant rather than irrelevant if the facts and evidence make it so. As they do in this case.